Starch, supplied in Midwest diets primarily from high-moisture and dry corn grain and whole-plant corn silage, is an important source of energy for dairy cattle. However, the digestibility of corn starch can be highly variable. Various factors, particle size (fine vs. coarse grind), grain processing (steam flaked vs. dry rolled), storage method (dry vs. high-moisture corn), moisture content of high-moisture corn, type of corn endosperm, and corn silage maturity at harvest, chop length, and kernel processing, influence ruminal and or starch digestibility in lactating dairy cows. Because both physical and chemical properties of starch influence starch digestion, assessment of starch digestibility in the laboratory has been challenging. In an attempt to address variation in starch digestibility, NRC (2001) suggested empirical processing adjustment factors (PAF) to adjust non-fiber carbohydrate digestion coefficients for high-starch feeds. However, since no system to measure variation in processing adjustment factors for feedstuffs is available the PAF’s are subjective book values with minimal practical application. For corn silage, Ferreira (2002) developed a kernel processing score (KPS) to assess adequacy of kernel processing of corn silage. But, KPS only considers particle size and does not consider the influence of moisture content and endosperm type on starch digestion. Some commercial laboratories employ in situ or in vitro systems to evaluate starch digestibility, but methods are variable between laboratories and to date relationships to in vivo starch digestion are not well defined. What is Degree of Starch Access? After cooling the sample is re-treated with a second buffer and amyloglucosidase and stirred. The amount of starch liberated (recovered) from the un-ground, un-dried sample is then divided by the total starch content of the feed and percentage of starch recovered from the feed in its un-dried, un-ground form is determined. The DSA procedure is extremely sensitive to particle size (R2 = 0.99) and moderately sensitive to moisture content (R2 = 0.76) and endosperm type (R2 = 0.59), which are three primary factors that influence starch digestibility in corn grain. 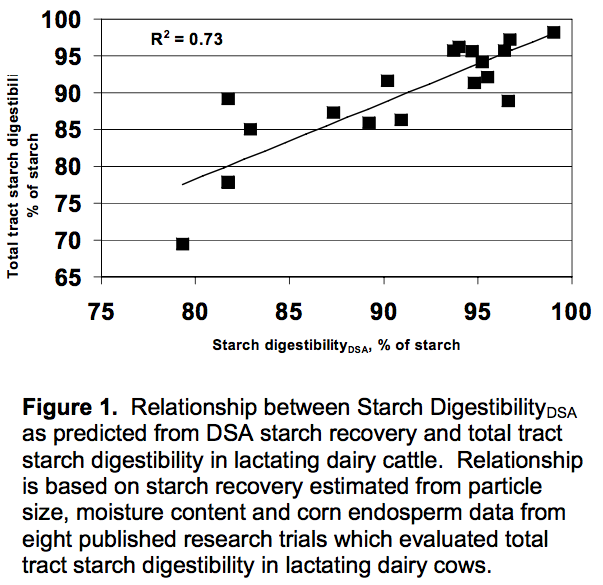 What is the Relationship between DSA and Starch Digestibility? The starch recovery procedure of DSA does not result in a direct estimate of starch digestibility. The DSA procedure only results in differences in starch recoveries. For example, the DSA procedure would recover 95 percent of the starch in finely ground corn but only 5 percent of the starch in whole shelled corn. Thus, the recovery values provide an index of the variation in degree of starch access among feeds. We reviewed eight research reports in the scientific literature with trials using lactating dairy cows, measuring total tract starch digestibility, which provided information on the particle size, moisture content, and endosperm type of the corns tested. From these data, we estimated their starch recovery values and evaluated the relationship between recovery values and their measures of total tract starch digestibility (Refer to Figure 1). This regression equation can be applied to starch recovery values generated from the DSA laboratory procedure yielding an estimate of total tract starch digestibility (termed Starch DigestibilityDSA). Starch DigestibilityDSA can then be used in summative energy equations (NRC, 2001) to provide energy values for corn-based feeds on a standardized basis. What are the Advantages and Limitations of DSA? The DSA assay: is relatively simple, is repeatable, can be adapted by commercial feed testing labs, requires minimal laboratory equipment, and does not require rumen fluid. The DSA assay is sensitive to factors in corn grain and whole-plant corn silage, such as particle size, moisture content, and endosperm type, which are known to influence corn starch digestibility. The DSA starch recovery values can be adjusted to the normal range of in vivo starch digestibilities observed in lactating dairy cows. The DSA assay also can determine relative starch digestion potentials of a heterogeneous feed, such as corn silage, or a non-heterogeneous feed, such as steam-flaked corn grain, and evaluate them on a similar scale which to date has been difficult with other laboratory procedures. Despite advantages, the DSA procedure does have limitations. At present, there are no data available to establish a direct relationship between a measured DSA value and in vivo starch digestibility, just a regression equation developed from literature reports. Also, the DSA assay may not distinguish the nuances of starch digestion by ruminants, such as the interactions between ruminal and post-ruminal starch digestion. The DSA assay may also be prone to background interferences of mono- and oligosaccharides, which could result in over-estimation of starch digestibility. How are Starch DigestibilityDSA values Interpreted? A summary of Starch DigestibilityDSA values observed for common corn-based feeds is presented in Table 1. The Starch DigestibilityDSA values for processed dry grain range from 98 percent for very fine-ground corn to 84 percent for cracked corn. 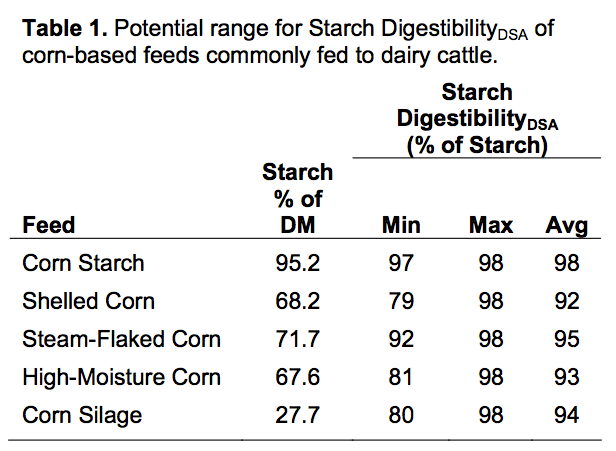 This 14 percentage unit difference in Starch DigestibilityDSA would translate into a 10 percentage unit difference in the TDN1x values for these corns calculated using a summative energy equation. At a 10 lb. dry matter per cow per day feeding rate of corn, failure to account for this difference in energy values could cost about 3 lb. of milk per cow per day. Beware of potential for milk fat test depression and(or) subacute ruminal acidosis when feeding corn-based feeds with “very high” Starch DigestibilityDSA in diets containing low neutral detergent fiber (NDF) from forage or low effective NDF, especially when in conjunction with sub par bunk management practices. Is the Starch DigestibilityDSA assay Commercially available? Yes, Starch DigestibilityDSA analysis of dry grains, high moisture grains, corn silage and specialty grains such as steamed flaked corn is commercially available at a number of commercial forage testing laboratories. Contact your local laboratory or the Marshfield Soil and Forage Testing Laboratory at the University of Wisconsin for more information about sample submission and cost. Blasel, H.M., P. C. Hoffman, and R. D. Shaver. 2006. Degree of starch access: An enzymatic method to determine starch degradation potential of corn grain and corn silage. Anim. Feed Sci. Technol. 128:96-107. Crocker, L.M., E. J. DePeters, J. G. Fadel, H. Perez- Monti, S. J. Taylor, J. A. Wyckoff, and R. A. Zinn. 1998. Influence of processed corn grain in diets of dairy cows on digestion of nutrients and milk composition. J. Dairy Sci. 81: 2394-2407. Ferreira, G., 2002. Nutritive evaluation of corn silage: Factors affecting corn silage digestibility and their effects on performance by lactating cows. MS Thesis. University of Wisconsin, Madison, WI, USA. Joy, M. T., E. J. DePeters, J. G. Fadel, and R. A. Zinn. 1997. Effects of corn processing on the site and extent of digestion in lactating cows. J. Dairy Sci. 80: 2087-2097. Knowlton, K.F., M. S. Allen, and P. S. Erickson. 1996. Lasalocid and particle size of corn grain for dairy cows in early lactation. 1. Effect on performance, serum metabolites, and nutrient digestibility. J. Dairy Sci. 79: 557-564. Knowlton, K. F., B. P. Blenn, and R. A. Erdman. 1998. Performance, ruminal fermentation, and site of starch digestion in early lactation cows fed corn grain harvested and processed differently. J. Dairy Sci. 81:1972-1984. Oba, M, and M. S. Allen. 2003. Effects of corn grain conservation method on ruminal digestion kinetics for lactating dairy cows at two dietary starch concentrations. J. Dairy Sci. 86:184-194. Remond, D., Cabrer-Estrada J.I., Chapion M., Chauveau B., Coudure R., Poncet C., 2004. Effect of corn particle size on site and extent of starch digestion in lactating dairy cows. J. Dairy Sci. 87:1389-1399. Taylor, C. C. and M. S. Allen. 2005. Corn grain endosperm type and brown midrib 3 corn silage: Site of digestion and ruminal digestion kinetics in lactating cows. J. Dairy Sci. 88:1413-1424.